We have our first non-UT/Trib poll result for this cycle. Both candidates are well-known in the state, but Davis, at this early juncture, is viewed Very Unfavorably by 34% of the state’s voters, compared to just 17% who feel that way about Abbott. Thirty-four percent (34%) have a Very Favorable opinion of the GOP candidate, while 22% view Davis Very Favorably. 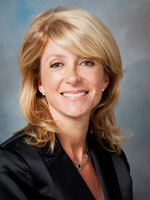 Davis leads among women voters 53% to 41%, but Abbott leads among men by better than two-to-one – 66% to 29%. Each candidate earns 91% support from voters in their respective party. Abbott leads 50% to 37% among unaffiliated voters. Link via Trail Blazers. I’m not going to dive into this poll, I’m just going to make a broad observation. The goal of Battleground Texas is to upend the “likely voter” screening model that tends to get used, especially in an off-year election like this, by getting not-so-likely voters to turn out. How successful they are at that will directly affect how accurate a poll result like this will be. Perhaps later in the cycle there will be some empirical evidence to suggest the scope of BGT’s effect, but for now I’d expect most pollsters to not deviate from standard models. It’s what I’d do if I were them, at least for now. The flip side of that is how they account for the actual turnout of 2010, which went from being a good year for Republicans to a historic wave precisely because a bunch of their previously unlikely voters turned out for them. I presume pollsters are basing their screens on the expectation that at least some of these folks are now truly “likely” for an off year election. Where they draw that line will also have an effect on results. I have no idea what the “right” answer is for these questions – I fully expect we won’t have a good feel for that till several months from now. I suspect we’ll see some variations in poll results, across pollsters and over time from the same pollsters, as they deal with this.